You’re planning to go from Flagstaff to the Grand Canyon. 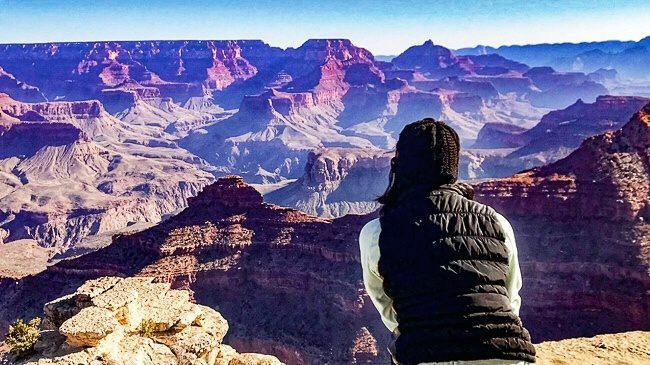 Of course, you want your Grand Canyon day trip to be a success! After all, it’s not every day you visit one of the 7 Natural Wonders of the World, not to mention a national American treasure. the best place to view the Grand Canyon, and more! 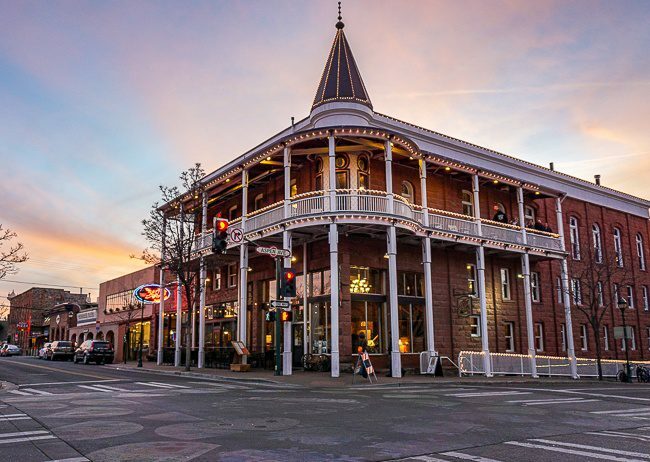 A destination in its own right, there’s certainly no shortage of things to do in Flagstaff! 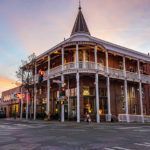 It just so happens this northern Arizona mountain town is also within a stone’s throw of the Grand Canyon. Of the 6 million+ visitors who plan a trip to the Grand Canyon every year, more than 5 million of them make Flagstaff their base for exploring the area. If you were thinking of doing the same, you’re on the right track! Where to stay when visiting the Grand Canyon for the day is a no-brainer. Flagstaff makes the perfect gateway town to explore the Grand Canyon. How far is it from Flagstaff, AZ to the Grand Canyon? First, let’s be really clear that we’re talking about the South Rim. The South Rim of the Grand Canyon is where you’ll find the iconic vast open canyon views you see on Instagram and in movies and guide books. It’s here the canyon gorge is at its widest and most dramatic, with views nothing short of awe-inspiring. From Flagstaff to the Grand Canyon’s South Rim, it’s a short 79 miles or just a 90-minute drive. The South Rim is also open year-round while the North Rim is only open for half of the year. Better yet, Flagstaff hotels are available to suit every need, be it pet-friendly or easy on the wallet! Many people think of Las Vegas to the Grand Canyon South Rim as the most direct route but, in fact, it’s a 4 1/2 drive one-way. It would be a similar length drive if you were to add a Grand Canyon road trip to the end of a Utah National Parks road trip. If you’re flying into Arizona, consider that it takes a little over 4 hours to get to the Grand Canyon from the Phoenix-Tempe area. 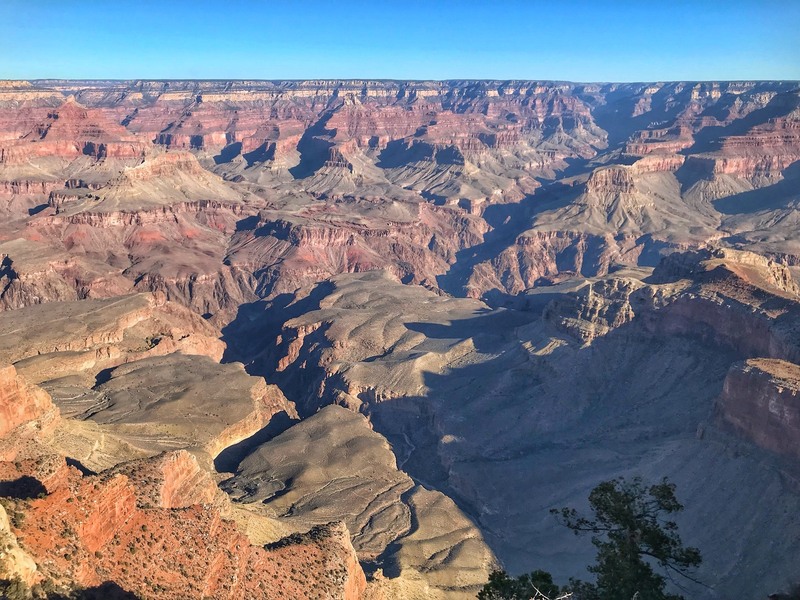 For a full day at the Grand Canyon, it’s best to do the drive and your National Park visit on separate days or connect your visit with a longer Arizona road trip. The best time of year to visit the Grand Canyon is in the spring between March and May and in the Fall between September and November. The temperatures at the Grand Canyon during these prime months will typically range from 30°-70° and most commonly in the comfortable middle of this range. The summer vacation crowds have yet to arrive or have returned to school and work. Trails, popular viewpoints, National Park roads, and parking lots are all less congested and easier to manage. I visited in November and, by midday, I no longer needed the hat or to keep my vest zipped. I wore 2 thin layers on top and just hiking pants with no base underneath and stayed comfortable throughout the day. Of course, summer is when most people take vacations. Just be prepared for hot summer temperatures, especially if your hiking down into the canyon where it can get up and over 100°! Also, arrive early to avoid parking hassles and crowding at popular spots. The itinerary ideas in this guide assume you’ll have a car of your own to get from Flagstaff to the Grand Canyon. If you don’t, you’ll need a guided tour to help you get around the area. If you don’t have a car for your trip or prefer not to deal with traffic and parking hassles, you’ll best maximize your time with a Grand Canyon tour. An expert guide will help you see the best of the Grand Canyon and take away any of the worries over transportation logistics. Grand Canyon tours are also useful if you’re looking for a specialty experience, like flying over the canyon in a helicopter or choosing to ride the Grand Canyon Railway. 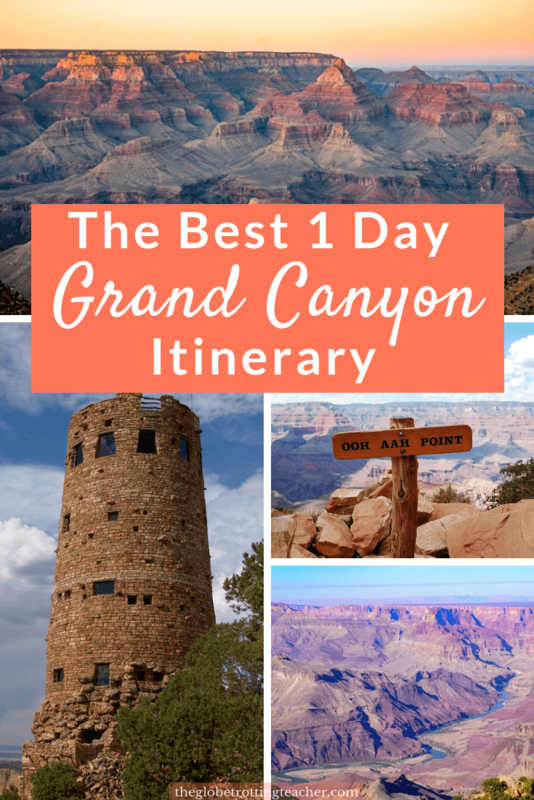 Planning what to see in the Grand Canyon in one day can feel like a daunting task. 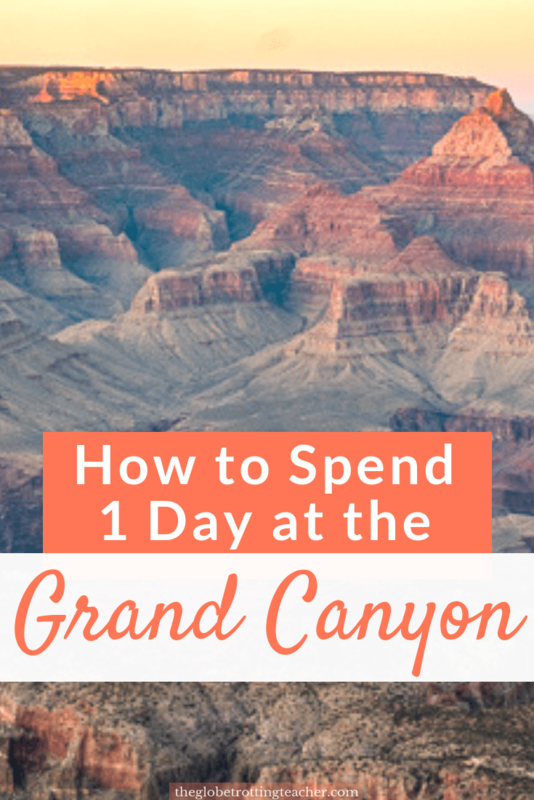 In order for you to get the best use of this guide, I’m going to outline how to spend one day in the Grand Canyon from a big picture standpoint. Then, each section below will break down the information you need to organize your Grand Canyon vacation. 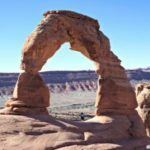 The itinerary below is a full day from sun up to sun down, but the plan is easily modified based on what you’d like to see and do in the Grand Canyon. Because Flagstaff to the Grand Canyon South Rim is just 90 minutes, seeing the sunrise over the Grand Canyon is doable and absolutely recommended. Not only is it a wonder to see, but you’ll also arrive in the National Park and have easy access to parking and a full day to explore. If you’re visiting several national parks and already have an America the Beautiful Pass, it’ll be even quicker as you bypass stopping to pay the park entrance fee. Park at the Visitor’s Center and plan to leave your car for the day. Head to Mather Point and the surrounding lookout points nearby to watch the sun come up. With the sun over the horizon, take the opportunity to get yourself ready for the day. 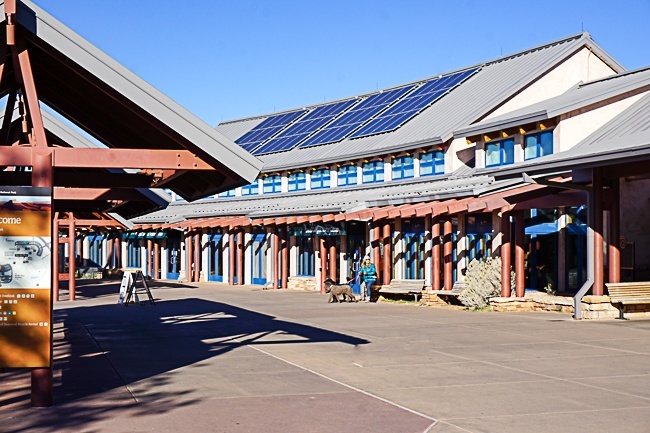 The Visitor Center area has bathrooms, a place to get food and water, and access to Park Rangers where you can ask questions and get maps. 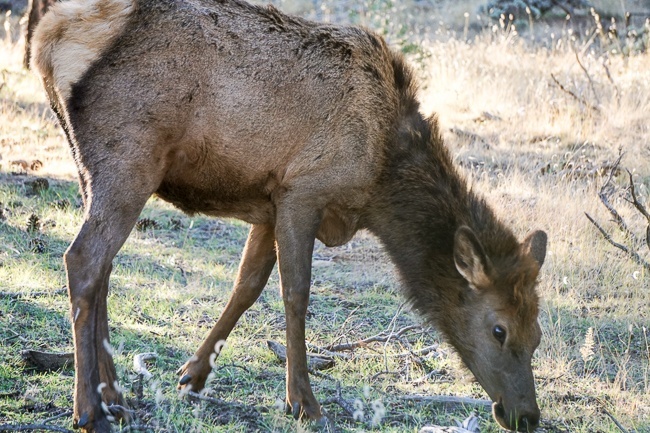 There are also picnic areas to eat breakfast, but as long as you follow the “leave no trace” motto, there’s no reason not to eat that breakfast sandwich sitting someplace along the rim in and around the Mather Point area. Not only is day hiking in the Grand Canyon possible, but it’s also highly recommended as long as you respect your physical abilities. Most visitors actually don’t hike down into the canyon, which adds up to a major plus for anyone who does. 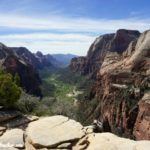 Whichever hike you do (see more details about hikes below), you’ll want it to be the first thing you do. You’ll have energy from breakfast, fresh legs, the benefit of cooler morning temperatures, and the opportunity to avoid the stronger midday sun. Remember, most hikes in the Grand Canyon have very little shade. Depending on where you hiked for the morning, make your way to the section of the Rim Trail between Yavapai Point and Verkamp’s Visitor Center. This section of the path is named the Trail of Time because it takes you through a series of geology exhibits about the Grand Canyon. 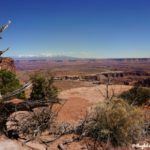 If you packed lunch, there are plenty of spots to find an open rock along the rim to eat, rest, stroll, and take photos while looking out over the canyon and learning a bit about how it was formed so many million years ago. Market Plaza is also in the vicinity and has full amenities including bathrooms and places to get food and drink. The eastern section of the South Rim has viewpoints leading to the Desert View Watchtower along a 22-mile stretch along a scenic road with several pull-offs and canyon overlooks. This is also the section of the National Park where I spotted the most animals, including a large herd of elk and several wild horses. Grandview Point, the Tusayan Pueblo ruins, Lipan Point and the Desert View Watchtower are the highlights along this self-guided drive. But, you’ll need a car to reach this part of the South Rim, as this scenic drive is past where you can get with the free shuttle buses. If you entered the park from the south entrance, ending your day by exiting along this eastern scenic route back to Flagstaff will give you a chance to see a more wooded side of the Grand Canyon, with plenty of the Ponderosa Pines present throughout northern Arizona. If you’re visiting the park without a car, use the afternoon to explore the lookout points along the western side of the South Rim using the Hermits Rest Route (Red) shuttle bus. 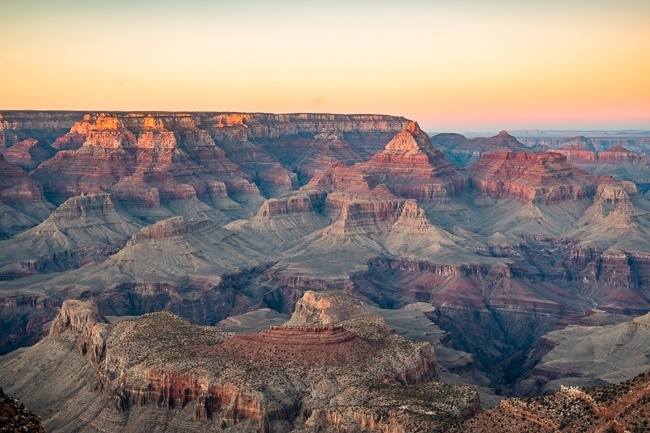 Depending on the time of year you visit the Grand Canyon, sunset times will vary. If sunset is later, you might want to go for an early dinner at the Bright Angel Lodge or the El Tovar Hotel. The National Park recommends, though, arriving at your sunset view location 90 minutes before sunset. 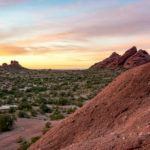 If you’ve spent the afternoon along the scenic drive to Desert View Watchtower, you’ll have great sunset vantage points from Lipan Point and Desert View. Hopi Point along Hermit Road is the favorite sunset spot. So, if you spent the afternoon on this side of the South Rim, you’re already positioned for sunset. And if you’d like to stargaze over the Grand Canyon or even go on a night hike, check the Park Ranger programs to see which events are happening on the day of your visit. A night experience is a truly unforgettable way to end a fantastic day at the Grand Canyon before returning to your Flagstaff hotel. 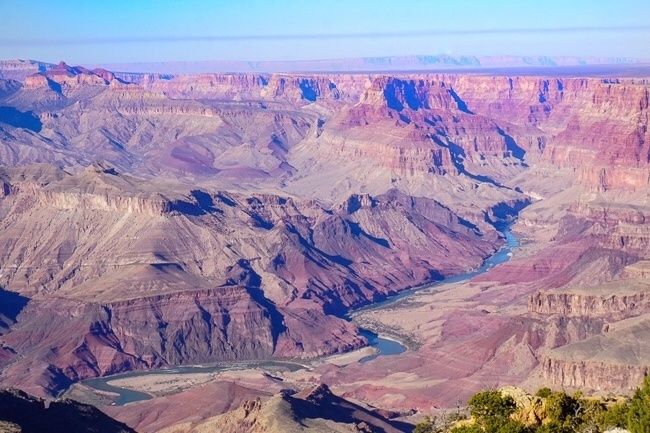 If you’re like most people, you’re probably planning a one day Grand Canyon itinerary. And, of course, you want to see and photograph the National Park from its best spots! This spot is the closest lookout to the Visitor’s Center and therefore the busiest, too. But the canyon views from this spot are sweeping and truly breathtaking. If it’s your first visit to the Grand Canyon, you won’t want to miss this first glimpse of how spectacular the canyon is. Mather Point is also a popular spot to watch the sunrise. 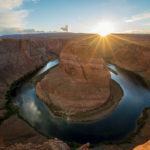 Expert Tip: To avoid some of the sunrise crowds at Mather Point, head a little bit east. 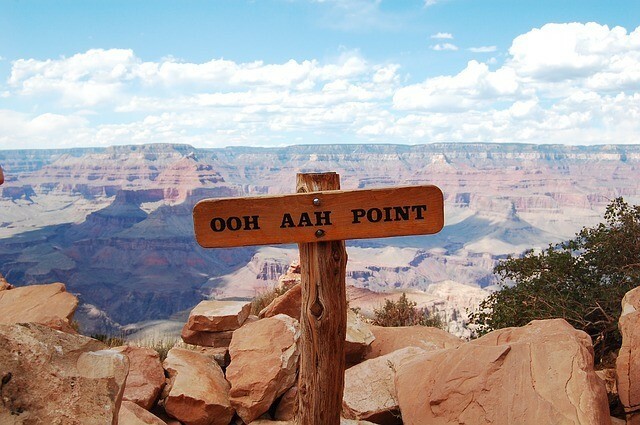 This is to the right if you’re standing at Mather Point looking out at the Canyon. There are plenty of little spots in this direction where you can watch the sun come up over the Grand Canyon away from the hustle of the Mather Point crowd. 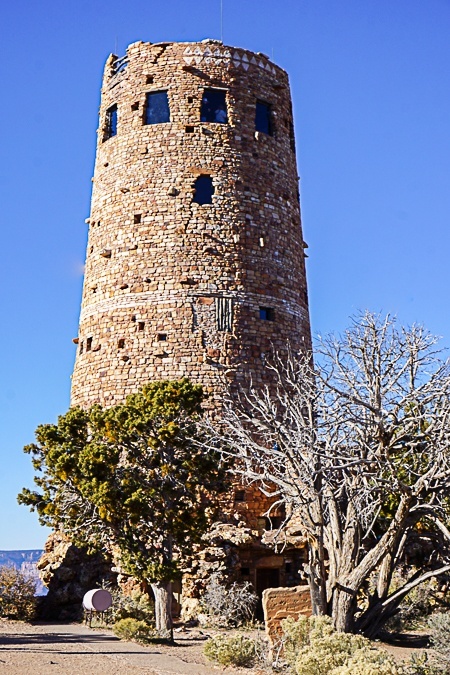 At the Grand Canyon’s eastern edge, the Desert View Watchtower vista is a different look at the canyon than what you’ll see at Mather Point but certainly no less spectacular. In fact, this was by far the best view I had of the Colorado River from any vantage point along the rim. You can also climb to the top of the watchtower for some history and a different level lookout over the viewpoint. The western edge viewpoints along Hermit Road are some of the best anywhere at the Grand Canyon. Hopi Point offers 180° panoramic views for some of the best photos you’ll take all day! It’s also a popular spot to watch the sunset, just be sure to arrive early to secure a spot or to find your own nook to watch the sun go down and, of course, take photos! Expert Tip: In general, the lookout points along Hermit Road are quieter, but no less spectacular, than the spots along the Rim Trail between the Visitor’s Center and the Village. With the help of the shuttle bus system, you could find yourself away from the bigger crowds and in a spot just as beautiful. Whether or not you plan out your day using the outline above, all depends on what you’d like for your day at the Grand Canyon, the time of year you visit, and who your travel companions (if any) are. 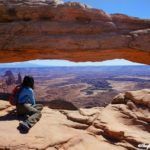 Here are a few ideas about what to do at the Grand Canyon as you tailor the itinerary above to fit your travel plans. Most people who visit the Grand Canyon stay along the rim and simply take in the sweeping views. But Grand Canyon day hikes are not only doable but also come with their own rewards. You’ll get to see the canyon from a whole new vantage point, separate yourself from the crowds along the rim, and experience the Grand Canyon in a way that’s all your own. Join a Free Ranger Program. 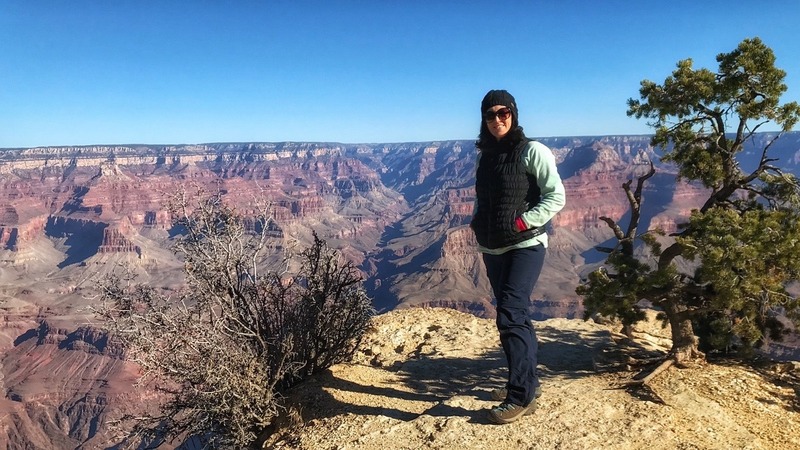 From Critter Chats to ranger-led talks about the geology of the Grand Canyon to after dark star walks, programs are free and held year-round at the South Rim dependent on the weather, of course. Some of the programs are family-friendly. Ranger talks and short tours also available from the Desert View area of the park. Check the schedule for South Rim Park Ranger Programs during the time of your visit. Watch the Grand Canyon Film. 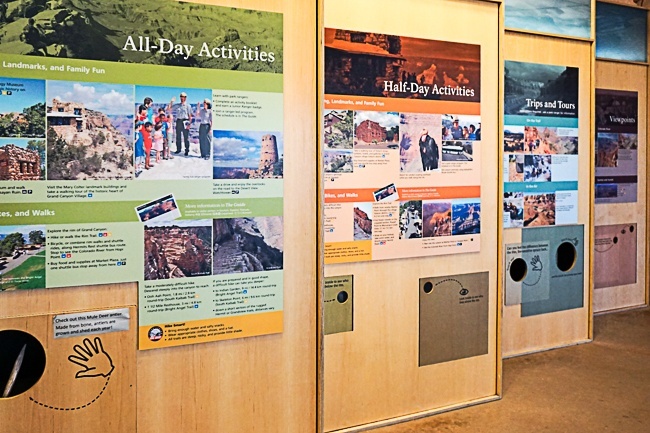 At the South Rim Visitor’s Center, you can watch a short movie all about the Grand Canyon, its history and natural environment. It runs on the hour and half hour and is a great way to start your day at the National Park. Check out the views from Hermit Road. Grand Canyon National Park runs free shuttle buses to most areas along the South Rim, including Hermit Road. Visit Hopi Point, Pima Point, and the Abyss for some of the most scenic views of the canyon. Expert Tip: If you visit in the winter months, December-February, it’s possible to drive your own vehicle along Hermit Road because this shuttle bus route only operates Spring-Fall. 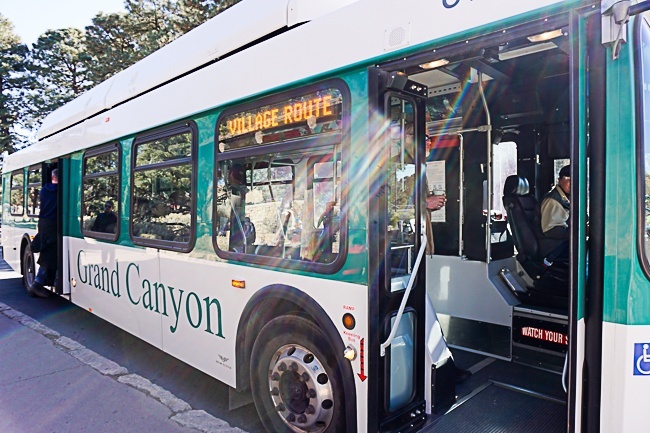 Keep reading for more information on how to best use the shuttle buses in Grand Canyon National Park. Go for a South Rim Mule Trip. 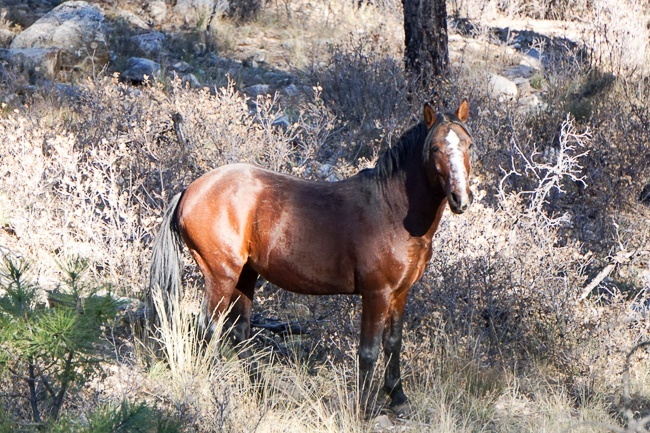 Ride along the rim or journey down to Phantom Ranch for an overnight ride. 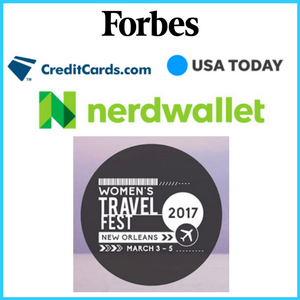 Either way, be sure to book in advance of your trip, as rides book up months and months ahead of time. Drive to the Desert View Watchtower. Open to the public, this 25-mile route is a destination all to its self! Take your time along this scenic drive and stop along the way at viewpoints like Moran and Lipan on your way to the watchtower. From the Desert View Watchtower, you’ll be able to see the Colorado River and sweeping panoramic views of the canyon. You can also climb to the top of the watchtower and learn more about the meaning behind why it’s there. Stop to See the Tusayan Ruins. Along the way to the Desert View Watchtower, you can stop at the Tusayan Ruins and walk to the remains of a Pueblo village. There’s also a free museum and guided ranger tours of the ruins between 11-2 during the summer months. Ride your own bike or rent one within the park at Bright Angel Bicycles. 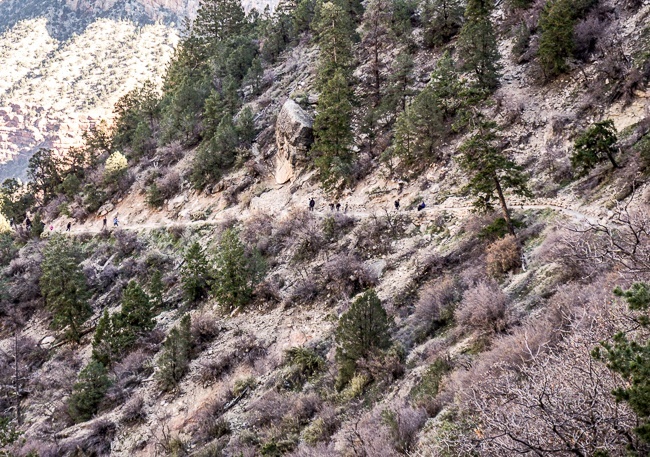 The Hermit Road Greenway is a popular place for cyclists visiting the Grand Canyon. The paved trail is just under 3 miles one-way and passes by 6 rim overlooks. All hikes down must come back up! The Grand Canyon South Rim hikes offer a variety of trails for all visitors spending a day at the Grand Canyon. As I’ve said above, I highly recommend setting off on a day hike, even if it’s just part of the trail before turning back. No matter what, it’s important to be prepared. Pack a daypack with the essentials, hiking shoes, food, water, and sunscreen. Respect your hiking abilities! 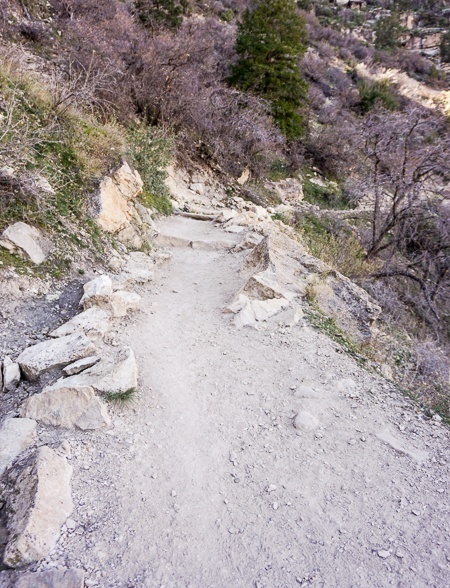 The trails down into the canyon are all steep. Coming back up can be tough, especially combined with the altitude. Summer heat will add to the strenuousness of a hike. Take regular breaks, which shouldn’t be hard to do if you’re trigger-happy with your camera like I am. And, be watchful of how much time you’re taking. It’ll take more time to hike up out of the canyon than it did going down into it. I’m in decent physical shape and still took plenty of breaks on the way back up! With that, here are the 3 of the best Grand Canyon hikes for day-trippers. 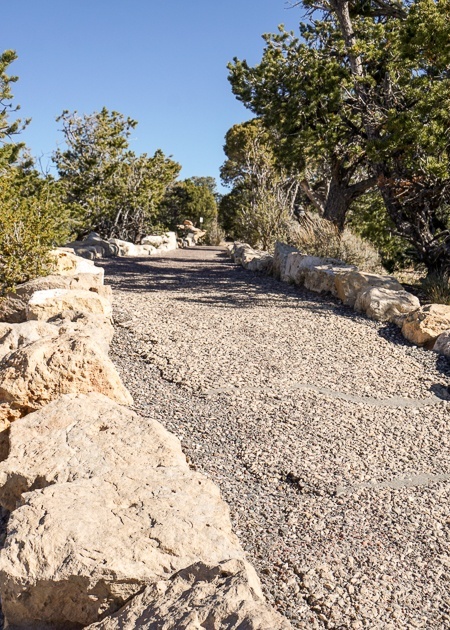 This 13-mile, mostly paved trail is between the South Kaibab trailhead and Hermit’s Rest. There are canyon views at just about every step, except when the pine tree clusters along the rim thicken just enough to momentarily block the view. This trail is mostly flat, with just the occasional gentle incline. It’s an easy walk along the rim and perfect for all ability levels. 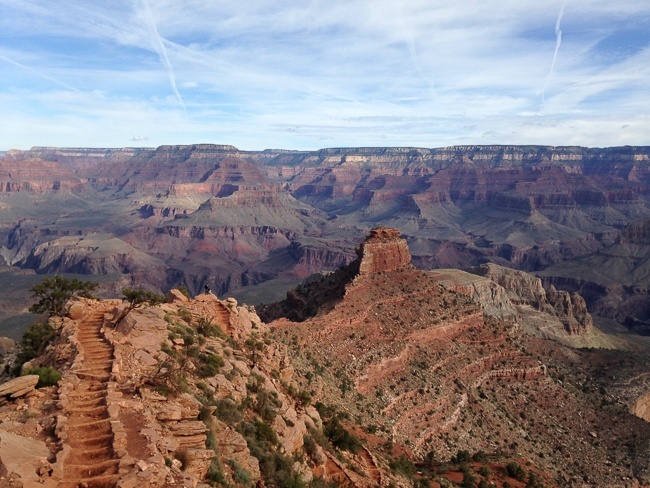 This steep, gravel to dirt trail is one of the most popular Grand Canyon South Rim day hikes. From start to finish, the round trip is 12 miles. However, the National Park Service explicitly warns against attempting to do the entire round trip in a single day. What I really loved about the Bright Angel Trail were the trail markers like 1st Tunnel, 2nd Tunnel, 2-mile Switchback which help you hike down into the canyon just part of the way for manageable roundtrip distances depending on your physical fitness and timing for the return trip back up to the rim. To get to the South Kaibab trailhead, you’ll need to take the Kaibab/Rim Route (Orange) shuttle bus. This steep, dirt trail is well-maintained, with a couple of popular lookout points/rest stops along the way. Completing the entire hike is a 6 miles round trip journey, with National Park warnings not to venture past this point for a day hike. Instead, it’s more enjoyable for most day hikers to turn back at Ooh-Aah Point or Cedar Ridge for a 1.8 or 3-mile round trip hike, respectively. If you drive to the Grand Canyon from Flagstaff, it’s best to keep your car parked once you find a spot. Fortunately, Grand Canyon National Park has free shuttle buses to get around the South Rim. There are 4 routes, each one with its own name and color. During the day, all the shuttle buses run every 10-15 minutes, except for the Tusayan Route which runs every 20 minutes. In order to see the Grand Canyon in one day and maximize your time, plan out which places, viewpoints, and hiking trails you’d like to visit. Then, map out which shuttle buses will help you move around the park. 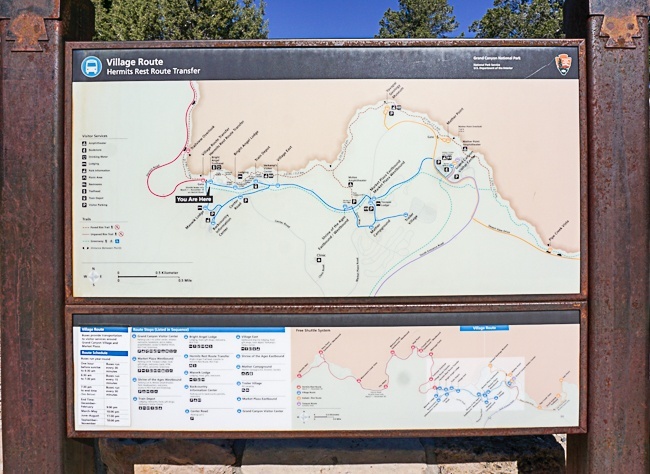 For example, if you want to start your day a the Visitor’s Center and Mather Point but would also like to hike the Bright Angel Trail, it makes sense to save time by using the Village Route (Blue) Shuttle to get to the trailhead. Once you’re done hiking, you can use the Hermits Rest (Red) Route to see the canyon vistas from Pima Point. – Grand Canyon National Park costs $35 per vehicle to enter. The pass is good for 7 days and can be used for the South and North Rims. 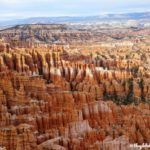 If you’re planning to visit other National Parks like Zion or Bryce, you’ll probably want to invest in the America the Beautiful Pass. It’s just $79.99 and is valid for entry for everyone in your vehicle at all National Parks and Monuments for the whole year. – The Grand Canyon stays on Mountain Standard Time and doesn’t spring forward for daylight savings. 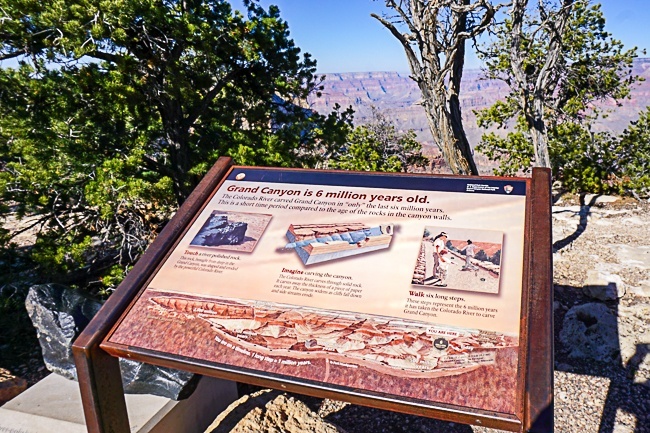 – When possible, use the free shuttle buses to get around the South Rim. Particularly during the busy summer months, parking lots are full and moving your car unnecessarily can mean losing time searching for another parking spot. – There are many water-bottle filling stations, especially in the high-trafficked areas along the South Rim. Go green and bring a reusable water bottle to use for the day. – Check the weather before your trip and dress appropriately. Breathable, comfortable hiking clothes are best, even if you don’t plan to do a big hike! Layers are great for Spring and Fall when the mornings are cool but the afternoons warm up. Regardless of the season, boots, sneakers, or sandals made for hiking are a must. The Grand Canyon is an absolute bucket list travel experience! 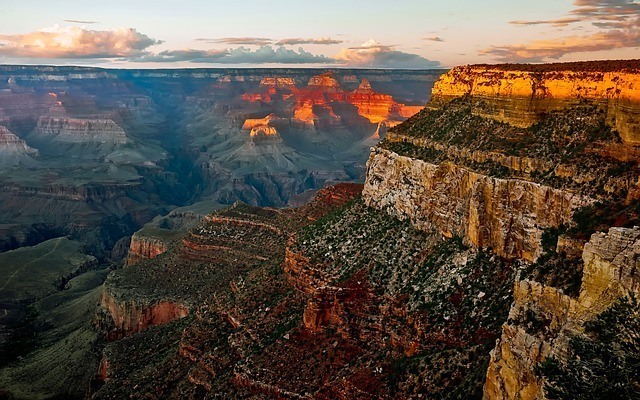 Spend a day at the Grand Canyon and prepare to be wowed by this phenomenal natural wonder. Are you planning the best way to see the Grand Canyon in one day from Flagstaff?